Rimmers Holoship badge from the episode Holoship. It was was aired as the first episode of series V and follows the plot of encountering another ship full of holograms like Rimmer. Rimmers Holoship badge seen on screen. 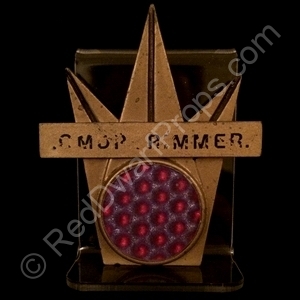 Rimmers Holoship badge reads “CMDR Rimmer”. 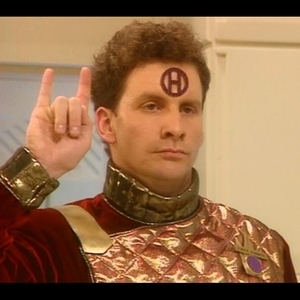 It is similar in design to the style of badge we see Rimmer wearing on his standard uniform – but with the addition of a red/blue holographic disc mounted below his rank. 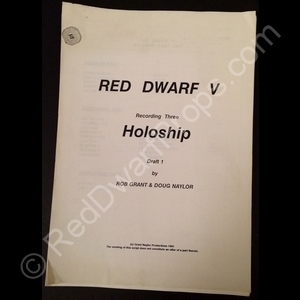 I also have an original first draft matching Holoship script written by Rob Grant & Doug Naylor. It states “recording three”, as although it was aired 1st in series V, it was actually filmed 3rd. Tagged 1992, Chris Barrie, Holoship, Rimmer, Script, Series V. Bookmark the permalink.